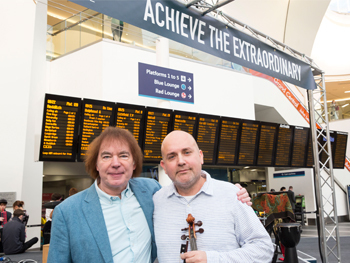 Rail commuters and shoppers have enjoyed a musical treat as the Royal Birmingham Conservatoire’s Folk Ensemble performed a unique series of free concerts in Birmingham New Street station. The Conservatoire Folk Ensemble features a stage-challenging 65 members and they all performed under the interchange’s main departure boards within the station’s domed atrium throughout the day. The musical extravaganza on Thursday 25 January was organised to coincide with the Royal Birmingham Conservatoire’s Music Open Day, which welcomed prospective undergraduate and postgr aduate students to its new home, just a short walk from the station in the Eastside region of the Midlands city. 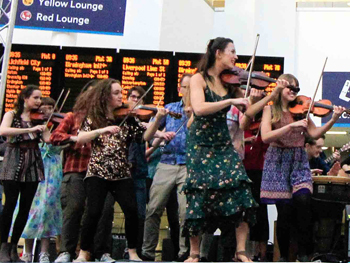 “From Johann Strauss to Duke Ellington to Kylie Minogue, the railways have inspired musicians over the last 200 years and The Conservatoire Folk Ensemble have continued that tradition as they raised the roof of New Street station with their infectious energy and impressive musicality. We welcomed hundreds of visitors to our Music Open Day and many of those arrived by train at Birmingham New Street station. The performances by The Conservatoire Folk Ensemble provided a unique gateway to their wider visit and, for the thousands of other commuters, shoppers and residents who use the station daily, it showcased Birmingham as a culturally rich destination of international significance. The event was arranged in partnership with Network Rail, who also helped the Conservatoire’s parent institution, Birmingham City University, stage an ambitious fashion show in the station last year, where Fashion Design graduates showcased their latest collections along a specially-made runway. Following a major redevelopment which opened in September 2015, Birmingham New Street station has been transformed into a major transport and shopping hub. Welcoming 140,000 passengers daily, its new concourse is now three and a half times bigger than before. This space is enclosed by a giant glass-roofed atrium, allowing natural light to brighten the entire area, including all 12 refurbished platforms. The station also contains Parkside Platform, an exhibition space run by Birmingham City University and an addition to its Parkside Gallery which is located at its City Centre Campus in the Eastside of the city. Its current exhibition ‘Archived’ is the result of a collaboration between the Historical Instrument Collection (HIC) at the Royal Birmingham Conservatoire and the artistic responses of the University’s Photography BA (Hons) students. “The city of Birmingham is integral to the kind of folk music we make; noisy, full of energy and draws on the great breadth of music that Birmingham is famous for. To play in the rather unusual setting of the train station, right at the heart of the city, was really exciting and the reaction of commuters and prospective students as they are greeted by 65 musicians giving it their all was one I will never forget! Celebrating their 20th anniversary in 2017, The Conservatoire Folk Ensemble embarked on a series of headline dates across the country and also found time to record and release their debut full length studio album, ‘Painted’ (SAE Records). Run on an elective basis, The Conservatoire Folk Ensemble has become an enviable addition to the Royal Birmingham Conservatoire’s range of performing ensembles. A unique contemporary building, the £57 million Royal Birmingham Conservatoire incorporates five public performance spaces including its 500 seat Concert Hall for orchestral training and performance, a purpose-built organ studio and private rehearsal and practice rooms. Furthermore, as the first purpose built conservatoire in the UK since 1987, the new institution which opened in September last year is the only one of its kind in the country designed for the demands of the digital age.